The problem with the educational system, not only in the United States, but all over the world is that too much emphasis is placed on passing exams instead of actually learning and being able to use the information you are studying. We are taught, at a very early age, that passing exams and getting good grades is the most important thing there is. So, that’s exactly what we do; we “study” hard for the test, we even pull “all nighters” to do well on the exam the next day. But, once it’s over, we tend to forget or dismiss a large percentage of the information we had memorized in order to make room for information we will need on the next exam where we, once again, will concentrate all our efforts on passing it and getting the best possible grade without taking into account how we will use that information. For most students around the world, the information they study is only useful for passing exams. Scores are also a big problem. In a regular school, you can pass an exam or a grade with 65%, 70%, 80% or 90% (80% or 90% actually being considered “good grades”). But what this means is that every time you pass a test with one of those scores, you are actually accumulating 35%, 30%, 20% or 10% of doubts and lack of knowledge. What is The Delphian School doing about this? The Delphian School is changing this vicious cycle by placing more emphasis on students actually learning and being able to use the information in a practical manner. Obviously, there are still exams, but in order to pass from one subject to another, you must demonstrate 100% mastery of the subject. At Delphian, every time a student completes a course, he or she is given an exam; if the student gets 100% he passes on to the next course. If he gets anything below 100% on the exam, he has to go back and restudy the areas he missed and then retake the exam until he achieves 100% understanding and mastery of the subject. This system eliminates the fear or nervousness students feel while taking exams and actually encourages them to learn the information, instead of just memorizing it to pass the test or make the grade. But would this be possible to do in all schools? No, currently it isn’t possible to do in all regular schools because exams are given to the whole group at the end of a course or term. Then, how is the Delphian School able to do this? 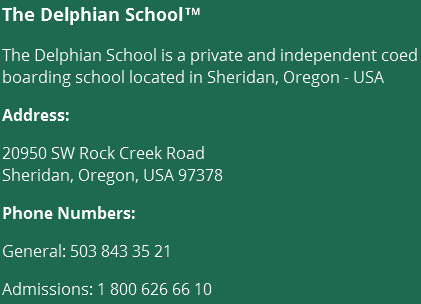 Well, because at the Delphian School students have an individualized program and each student advances at his or her own speed and decides which courses he takes, in what order and when. They have a list of courses that he or she must complete in order to pass on to the next grade, but they decide how they are going to go about completing all of them. They can also add other courses that he or she considers valuable to their career interests. This is a revolutionary approach to learning and education that really works but that is a little bit difficult to comprehend unless you see it and experience it for yourself.